I am linking up with Oh Boy 4th Grade for my favorite linky party. 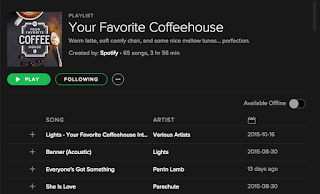 I heart Spotify so much... it is so great to be able to choose your own playlists, but I especially love listening to the playlists that they put together. 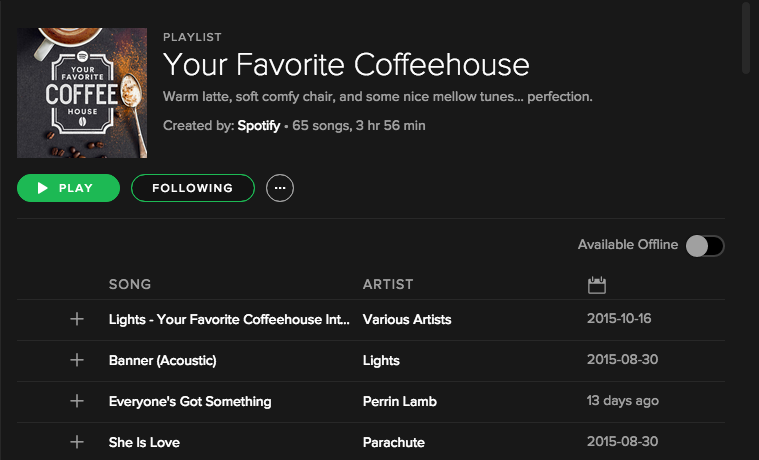 My favorite is called "Your Favorite Coffeehouse" and it is a ton of calming acoustic songs. I often play it during our center time at school and find new music that I love because of it. I love decorating for the seasons, and Fall is my second favorite to decorate for. Christmas is my most favorite, of course. I may have even just gone a little nuts in the Halloween clearance section of Target. I got some white ceramic pumpkins and a light up THANKFUL sign that were all 50% off. I couldn't resist! I absolutely love Thanksgiving. Ever since we bought our house four years ago we have hosted and I just LOVEEEE it! My grandma, uncle and niece always drive all the way from Michigan and this year we have family coming from Maine, Massachusetts and Washington DC too. I am already planning the menu in my head. 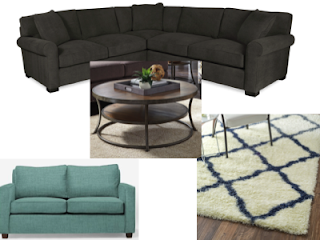 We FINALLY bought new couches for our living room and den, and these big purchases have given me the redecorating itch. I started a gallery wall in the living room (thanks to the help of a very talented friend) and redid the built in bookshelves in our den. I also just ordered a rug and a coffee table. With just a few more finishing touches, things should really start coming together! 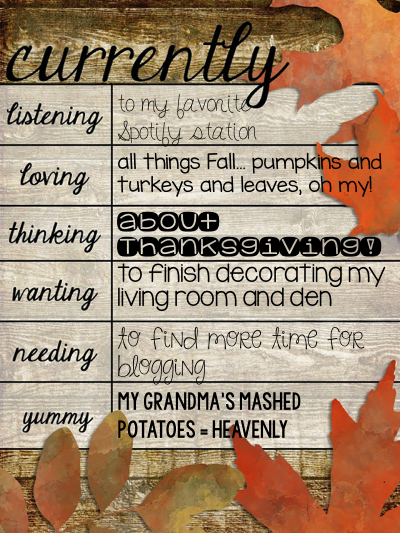 Not having enough time to blog has been really stressing me out lately. 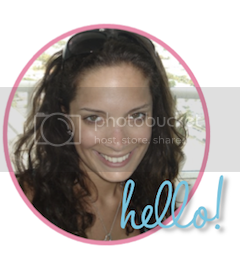 This blog is my baby, and my baby has truly been neglected for awhile now! I sometimes come down with a bad case of writer's block, and other times have great ideas with no time to actually sit down and write. 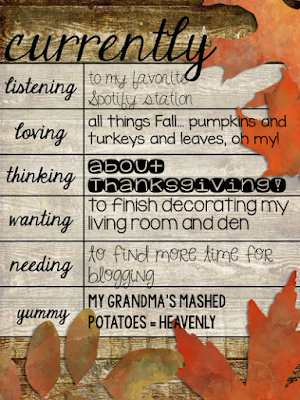 My new plan is to build time into my weekly schedule for blogging. Let me know if you have any suggestions! My grandmother makes the best mashed potatoes of all time. They are fluffy and creamy and I could eat plates and plates and plates of them. I try to make them from her recipe sometimes, and they never come out quite right. Yummmmm! Isn't it funny how we try to duplicate recipes but they never turn out like the original chef's version. Have a wonderful Thanksgiving with your family. Yummm mashed potatoes :D I'm feeling bad about my blog also. I neglected it all October because of lack of time! Are those the couches you bought? I desperately want a sectional! I also love holiday decorations. Scarecrows through snowmen! It's hard to make the time to put them out and put them away. And blog. And all the school things.I don't host Thanksgiving, though. That would be scary for everyone involved. :P Good luck!